For last few days there has been a spate of bad news all around the world starting from Boston, Bangalore Bombings, earthquake and latest Texas explosions. Sometimes I wonder what's become of us and who gave the right to Humans to be called God's best creation? I am not that kind who remain oblivious to the surronding environment. Anyway, coming back to the posting part today, I am posting a dessert called trfile. Now you can afford to have a weeknight dessert without breaking your head. Yes it's a no bake dessert which even ten year old kid can fix. Crumble the cake slices and keep aside. Cut strawberries in thick slices (lengthwise).In a medium bowl, using a hand mixer whip heavy cream until soft peaks form. Then add sugar and beat on low speed for 1 more minute (to check the soft peak, lift the beaters out of the cream, soft peaks should be fold over the beaters). Refrigerate until you are ready to assemble. 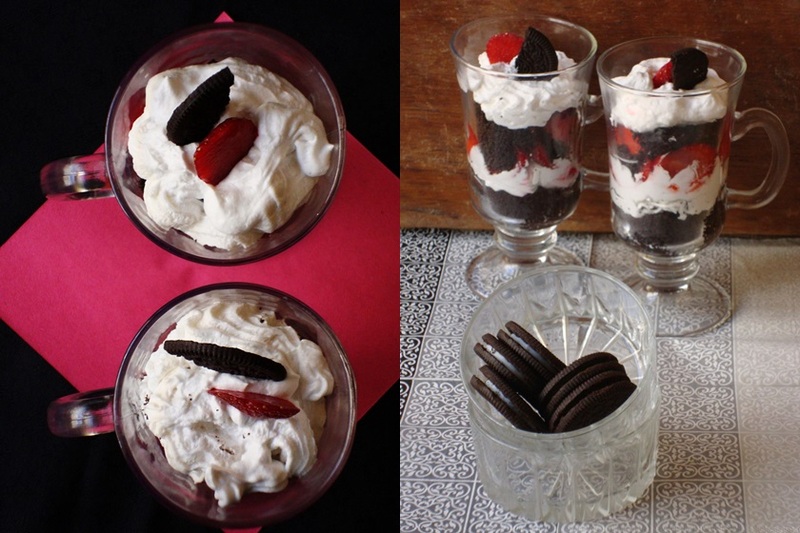 Take individual glass to show off the layers :-) Put Oreos into a ziplock bag and crush them. Spread the layer of cake crumbles first then sprinkle some crushed Oreos. Arrange the strawberries around sides of the glasses and fold in whipped cream( through a piping bag). Again arrange a layer of cake and crushed oreo. Throw some more strawberries and repeat the same process. Dollop remaining whipping cream on top and decorate with remaining broken Oreos. Chill and serve ! Such a gorgeous dessert.. Looks delicious! i am oreo fan,superb dessert. first time here.you have a lovely space,happy to follow you,will be glad if u follow mine. 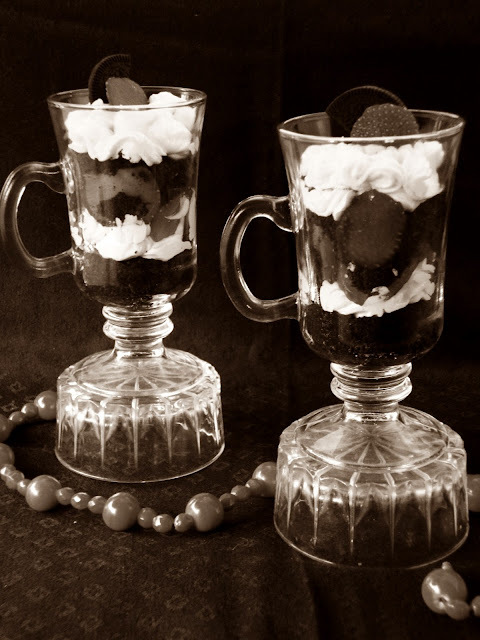 Quick and tempting dessert,lovely presentation Deepa. Very elegant and perfect clicks.. looks delicious !! Visiting the page after a longgg time. I loved the way you designed your title. 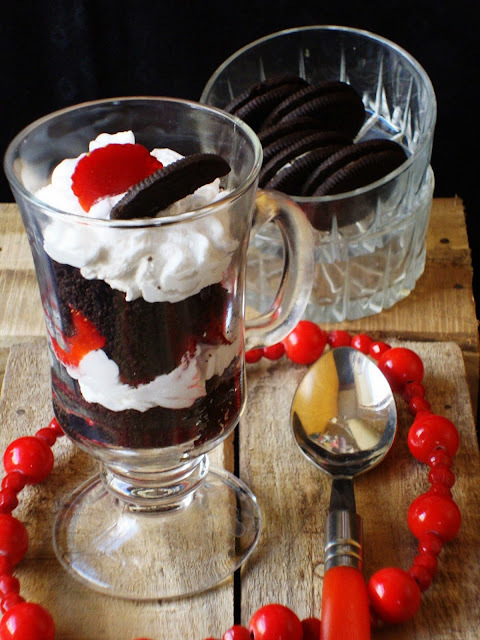 Oreo in a trifle is very clever..liked tat idea..very delectable. Omg!! A simple and an easy dessert loved by all. I am bookmarking this. That's a perfect dessert Deepa. So easy to put together as well. Cool cool dessert and so attractive! This is a great tasting dessert without any slogging. So, son living up to mom's name and rustling up fanstastic desserts.Pics are so inviting.. 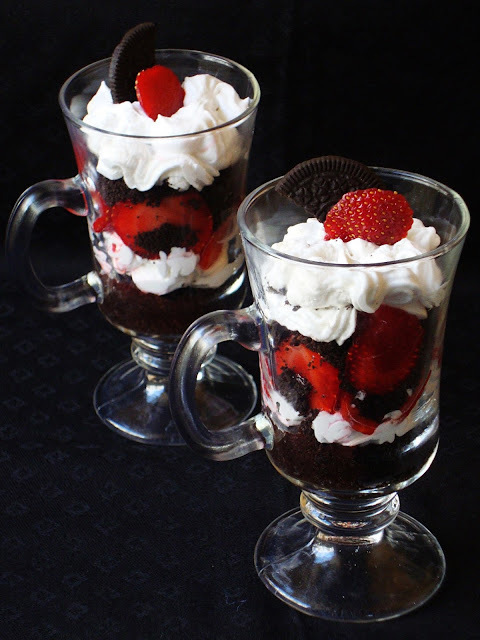 Very yummy triffle and nice clicks Deepa. Even my son is an ardent fan of orea cookies, am sure he will definitely finish this trifle in few seconds..Beautifully done. Cool and droolworthy dessert Deepa. I am an oreo fan, so will try it definitely. this is really very simple and easy to prepare. Where did u get whipping cream from? It may be simple but looks decadent.